Just a couple of weeks ago on June 4 Northrise University celebrated graduation and the dedication of the new Campus Center Building. What a historical day in the life of 49 new Northrise University graduates and their family and friends, and in the life of Northrise University, its faculty, staff and current student body, and so many Northrise friends and supporters from around the world! Doreen and I are grateful beyond measure for what God is doing at Northrise University! Only by the blessing and grace of God, and his steady hand on us, has Northrise University been possible. God has brought so many friends to join us in this work, who by their financial support and personal commitment have been with us every step along the way! Praise God! Our hearts are filled with thankfulness! At the conclusion of the graduation ceremony we moved to the dedication of the new Campus Center building. To God be the Glory and Honor for what He has done! We prayed over the Campus Center building and Jeff Goble, Chair of the Board of Trustees, shared his thoughts and the significance of this first major building on the new Northrise University campus. We cut the ribbon and the building was opened for tours and we had great fellowship with each other as we celebrated the dedication of the Campus Center. 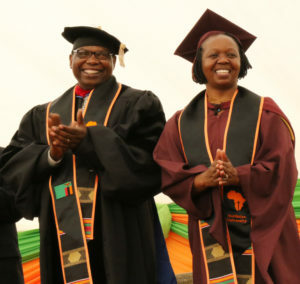 It was such a joyous occasion for Doreen and I, and all the staff and faculty and others who have worked so hard over the last few weeks to relocate the Northrise operation from downtown Ndola to the new site. The Campus Center is a beautiful building and an example of our desire at Northrise University to pursue excellence in all we do. With God’s direction and His hand we will continue to build Northrise University and give Him the Glory and the Honor! And on Friday afternoon preceeding our graduation and building dedication, we had the first meeting of the NU Board of Regents. Doreen and I are so encouraged with our new governance structure and assured that we now have in place a structure that will allow us to maintain our founding core values in perpetuity, better coordinate our decision-making process, develop and implement an on-going strategic plan, align and integrate our efforts and strengthen financial accountability, as we grow and scale Northrise University. This is a major step for Northrise University and a much-needed step as we strengthen our foundation, manage the current activities of Northrise and plan for the future. You will be receiving a general update from the Board Chair, Mr. Stroupe, following each Board of Regents meeting, communicating the Board’s activities, decisions, and sharing the near-term focus and priorities. Doreen and I are thankful for the time and commitment of those serving on the Board of Regents. Doreen and I are thankful to all of you, and to our staff, and faculty. There are not words adequate to express our joy, and our gratefulness to all of you who pray for us, encourage us and support us! Our hearts are full! We are so appreciative of all of you and privileged to walk with you as we build Northrise University together and remain obedient to the vision God gave us over 28 years ago! To God be the glory and honor! We praise Him for all He has done!